A Literary Odyssey: Book 32: The Misanthrope/Finished. I am not big on drama. I mean, I haven't had a whole lot of exposure to the world of theater, which is probably why I am missing some of the impact of this play. That is not to say I didn't like it. I certainly did, but it is quite different to read a play than a novel. Everything is based off the dialogue when you read a play. Your mind has to create the setting, etc based off what the characters are saying. Luckily for me, this play was excellent. The banter between the characters made it come alive and I managed to read all 52 pages in one short reading. For those of you who are unfamiliar with Moliere's play (I'm assuming that is almost all of you), it focuses on a small part of the aristocracy. The main male character, Alceste, believes that a person must be completely honest and never try to hide the truth. This obviously creates some problems as he bluntly says whatever he feels at a certain point in time. It also creates a lot of humor, which I much appreciated. The play begins with Alceste commenting on his view of social interaction, as well as his disapproval of a fellow's love poem. After criticizing the poem, Alceste ends up being taken to court (hilarious). It also touches on a love mess between Alceste and Celimene, a young flirtatious woman with many suitors. The situations and language make this play hilarious, as you wonder what the characters will say or do next. It also offers a lot to think abut socially. I know that I have had conversations about whether telling a little white lie is beneficial or not. 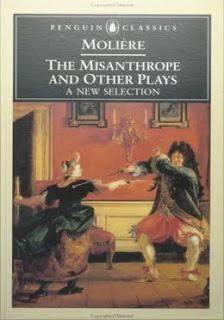 The Misanthrope almost serves as an example as to what happens when you don't tell anything but the blunt honest truth at all times. It gives you a lot to think about. I want to leave you with some of my favorite passages. "Are you, like all the rest of the fashionable world, fascinated by the dazzling merit of his fair wig? Do his many ribbons charm you?Is it by the attraction of hid great German breeches that he has conquered your heart, whilst at the same time he pretended to be your slave? Or have his manner of smiling, and his falsetto voice, found out the secret of moving your feelings?" (14). "At what is Oronte offended? and with what does he reproach me? Does it reflect upon his honor that he cannot write well? What is my opinion to him, which he has altogether wrongly construed? One may be a perfect gentleman, and write bad verses; those things have nothing to do with honor. I take him to be a gallant man in every way; a man of standing, of merit, and courage, anything you like, but he is a wretched author," (33). "I have no wish, sir, in any way to disturb, by an untimely affection, your good fortune. And I have no wish, sir, jealous or not jealous, to share aught in her heart with you. I swear henceforth not to pretend to it again. I peremptorily swear never to see her again. Madam, it remains with you to speak openly. Madam, you can explain yourself fearlessly," (46). I think this is a play I am definitely going to have to see if I get the chance. I feel I should also point out that the most recent adaptation just opened in December 2009 in London and stars Damian Lewis and Keira Knightley. I would so love to see Keira Knightley and Damian Lewis in this play! Oh wow! What headliners! And Keira Knightley has such a great history of playing Victorian characters. Thanks for sharing such a wonderful play! You make me think that I should be brave enough to tackle a play one these days! Hope you and your mum enjoy the play!